Today an important quarter final clash will be played for men's singles. Where big shots like World Number 1 and defending champion Djokovic, Federer, British tennis start Murray, Ferrer, and Tsonga will put their hands on line for the Semi-Final berth. Amazingly, Roger Federer has been given his shot at the Centre Court, whereas Novak Djokovic is to face his challenger at the Court No1. Similarly Murray will face Ferrer at Centre Court as well. The point here is why the World Number 1, and the defending champion Novak Djokovic slot has been adjusted in Court No1, but not in the Centre Court. It is likely to favour Federer who is looking for his record levelling seventh Wimbledon title, and since now a days the weather there has also been outcast, and been raining in recent times. 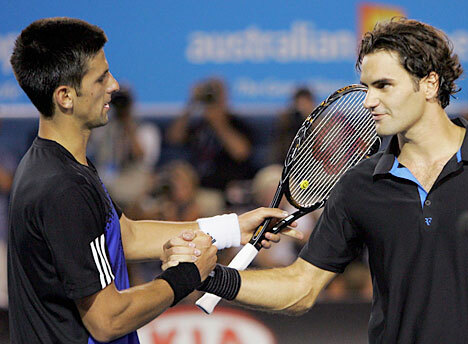 In order to avoid interruptions, he might have been place in precedence to Djokovic. Let's see, though Federer has a rather easier opponent and is likely to win for his Semi's berth. But Andy Murray will face tough time with David Ferrer who has been very relentless throughout the tournament.